In PD James’s novel Children of Men, published in the early 1990s, there is a strange passivity to the way that the end of the world is playing out. A slow winding down, less a bang than a whimper. When he filmed the novel nearly two decades later, Mexican director Alfonso Cuaron added urgency and contemporary political allegory – all the Blair-era refugee and terror fear that led philosopher Slavoj Zizek to call Cuaron’s film “the best diagnosis of the despair of late capitalism” – and the quiet gentility of James’ end-times Oxford was mostly sidelined. In a way, Mark Romanek’s recent film of Never Let Me Go, based on a novel on Kazuo Ishiguro, is closer in tone to the sedate James novel than Cuaron’s adaptation. But rather than a science-fiction Britain of the near future, Never Let Me Go gives us an alternate recent past. Opening titles tell us that post-war medical advances have pushed average life expectancy past 100 by the 1960s. By the time the story begins, in 1978, this medical paradise (for some) is well-established. The film is in three chapters, across three decades: Hailsham, 1978; The Cottages, 1985; Completion, 1994. There are no visible science-fiction touches in any of the settings, beyond the electronic bracelets worn by children at a boarding school in the opening chapter, that continue to be worn into adulthood. Otherwise, this could be the same 1970s we remember – or even earlier. The scene is idyllic, pastoral: a country house in long grass, games outside in summer, rows of beds in upstairs rooms and the school running according to clockwork. But melancholy seeps into it too. 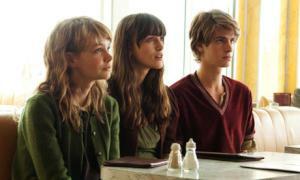 From the first minute, Never Let Me Go has the wistfulness of an epilogue. Hailsham is the name of the boarding school. But who are these children and why are they being kept apart? Why does their headmistress (Charlotte Rampling) tell them they’re special? Never Let Me Go – first the book, which was published in 2005, and then the movie, which was released in late 2010 and early 2011 and has just appeared on DVD – creates huge problems for anyone talking or writing about it. Spoilers aren’t the half of it. There are audience/genre issues. The film doesn’t look, feel and sound like science-fiction. Instead, it strikes you as a familiar kind of well-made British heritage picture with a melancholy sci-fi undertow, but given that science-fiction is normally used by fans of so-called serious literature as a pejorative (Margaret Atwood has been making a second career out of this position), you sense that it’s been a hard film to sell. And the numbers bear that out: on its US release last October, Never Let Me Go was considered an “undeniable disappointment”, with one of the reasons being – according to this LA Times blog – that “it’s a downer”. Even in the world of speculative arthouse cinema, they require a happy ending. The film came and went quietly in this country too and seems destined to be largely forgotten, not even attracting enough attention to become the object of a cult. Which is a real pity. This film needs to be rescued and remembered as a worthy entry in the fine, long tradition of cerebral, dystopian, British-set sci-fi, predating Children of Men and 28 Days Later, and stretching back through the likes of the 1970s series Survivors and the Quatermass films to Nineteen Eighty-Four and The Day of the Triffids. In Never Let Me Go, the world is not obviously ending. For most, life is being improved. But it dawns on us – and the children of Hailsham – that there is a cost. The children are clones, bred for a purpose – as they enter adulthood, they will donate vital organs to the non-cloned. They are being grown in isolation and harvested. They are expected to survive no more than two or three operations. Some of the clones will be donors and some will be carers. Not surviving is “completion”. Some want to find their “originals”. Every system has its euphemisms. What does it mean to live and what does it mean to love? What if, as in Blade Runner, the clones began to feel as deeply as “we” do, becoming creatures with self-consciousness? The good news is that Never Let Me Go is mostly not about anything as obvious as that. Nor is there any sense of the doomed or exploited rebelling against their fate, as in stories from The Matrix to The Island to Logan’s Run. When the three donors we follow through the story – well played by Andrew Garfield, Kiera Knightley and, especially, Carey Mulligan – figure out what is to happen to them, they passively accept it. Now you can see why the Americans thought it was a downer. Some have felt that the film’s last voice-over line — “Maybe none of us understand what we’ve lived through, or felt we’ve had enough time” – is laying Ishiguro’s theme on too heavily. But the balance seems about right to me, and this elegantly made film hardly puts a foot wrong. Its most intriguing and mysterious aspect is how little we learn about the world beyond – the point of view stays limited, with rumours but no hard information about the wider society, and little understanding of how the clones are perceived by the non-cloned. Or whether, as with animals in factory farms for us, the rest prefer to never even think about them. 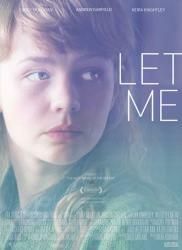 One of the great surprises of Never Let Me Go is that this English vision – the Japanese-born Ishiguro has lived in England since he was five and his friend, the English novelist Alex Garland, adapted the novel – has been brought to the screen by an American, Mark Romanek. But maybe the vision benefits from an outsider’s perspective, which Ishiguro may have provided too: his best-known novel, The Remains of the Day, is a subtle dissection of a self-deception at the heart of a very English life. Romanek has said that in his preparations for Never Let Me Go he caught up on post-war Japanese cinema, and laid its simplicity – think of Ozu — over this very English story. At the same time, you realise that the rituals and obsessions with appearance and decorum in The Remains of the Day can seem as traditionally Japanese as they are English. Romanek has also said he sees something profoundly English in the understatement and restraint of the story – that tragic, mustn’t-grumble passivity. So who is Mark Romanek? More than 20 years ago, I saw a film called Static in a largely empty Paramount cinema in Wellington. I remember it as a form of Lynchian Americana with satirical ideas about religion: a man who works in a crucifix factory claims he has invented a device that lets him see Heaven. Everyone else just sees static. For whatever reason, that first film didn’t lead to a second for more than 15 years. Romanek spent the time in between making music videos, at the expensive, borderline pretentious, high-concept end. “Scream” by Michael Jackson, “Hurt” by Johnny Cash and “Little Trouble Girl” by Sonic Youth are ones you might remember. One way to view Romanek is to take him as one of a cine-literate, music-clip generation, along with the likes of David Fincher, Jonathan Glazer, Michel Gondry and Spike Jonze, only with the weird good fortune to have made a first film before he made videos. His second film, One Hour Photo (2002), was the kind of thing music-video directors get accused (usually unfairly) of making on their first time out – a display of style and a scrapbook of influences. Or even a young man’s film, no matter that Romanek was over 40 by that point. That it’s yet another film about a lonesome male stalker with delusions of moral righteousness – less Travis Bickle than Rupert Pupkin, though – and that said stalker is played by Robin Williams, in what seemed like gimmick casting, didn’t help. The concept is that Williams’ Sy Parrish is the guy who develops photos in a printing outlet in a mall. He is a sociopath in a sunset industry, as digital cameras were just starting to go mass-market. He becomes obsessed with a family who seem to him to have the perfect life, and his obsession couldn’t be any more clearly spelt out – in his apartment, he has even made a shrine-like wall of their family snapshots. It all sounds pretty routine. But when watched a second time, after the far superior Never Let Me Go, it gives you a sense of the ideas that interest Romanek. The retail assistants occupy the same low caste status that the clones, bred for their body parts, do in Never Let Me Go – they are strictly second-tier humans, largely unnoticed. There is a fascination with seeing and surveillance – how we are watched and how we watch others (the perfect Mom’s first line of dialogue, to her son: “Make sure I can see you okay”). There is the same careful attention to architecture and interior spaces as in Never Let Me Go, which has a couple of beautiful establishing shots of British modernist buildings in its 1994 chapter, as though this alternate UK was still embracing a modernist utopian ideal. In One Hour Photo this is about giving the film’s non-places, in the sense that Marc Auge used the term – the mall, the hotel rooms, the hotel lobbies – an almost science-fiction presence. Romanek wrote One Hour Photo as well as directing. It’s been noted that in the decade since, its concept of privacy – hey, someone is stealing your family pictures and photographing you in secret! – seems almost quaint in an age of oversharing social media. Indeed, on Romanek’s excellent photo blog his life is an open book, which we are invited to flick through, as he takes meetings with other directors, mixes and launches his movies and catches fleeting glimpses of airport terminals and motorway tunnels from taxis. The perfect life? You might feel a little like Sy Parrish or some other second-tier human as you look closely at Romanek’s pics of film-maker pals — Gus Van Sant, Andrew Niccol, Spike Jonze, even Ron Howard – and follow that life around the world.